A little ingenuity combined with devoting a great deal of time and care, such as an irrigation pool, supports the tastiness of Hiroshima oysters with a reputation for high quality. Harvested oysters are normally shipped as they are after cleaning. However, Hiroshima oysters are subject to depuration taking one full day in sea-water pool before shipping. This is similar to the process of “sand removal” for asari clams. Removing all contaminants such as bacteria accumulated in the body removes any acrid taste and enhances the original oyster taste. Hiroshima Prefecture has enforced ordinances that shucked oysters eaten raw cannot be marketed without this depuration process, working towards stabilizing quality throughout the prefecture. Providing products responsibility by dividing harvest areas for raw eating and heat cooking. 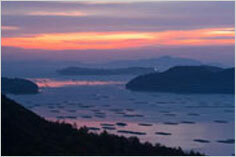 Hiroshima Prefecture intends to carefully cultivate oysters as prefectural symbol of fish. With this view, harvest areas are properly divided and strictly designated between raw-eaten and heat-cooked oysters. 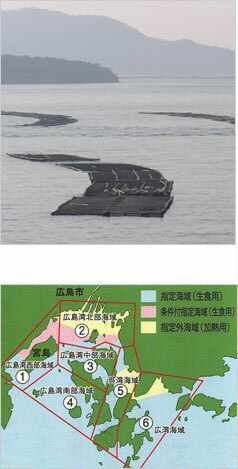 This is based on ordinances specific to Hiroshima Prefecture, and such designation of sea areas allows distinguishing the harvest area of shipped oysters. In addition, Kunihiro implements traceability by which the producer can be further identified. The coastal area of Hiroshima Bay in the Japan Inland Sea is especially calm. This makes it a place ideal for the cultivation of oysters with an abundance of plankton, into which fresh water containing iodine flows from the Ota-gawa River and mixes. As is known from the shells of Japanese oysters and densely lamellated oysters that were unearthed from shell mounds during the Jomon Era,(over 2000 years ago) oysters were also important for ancient people. It can be also imagined that a great deal of natural oysters were harvested at that time. 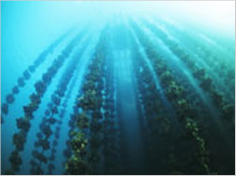 According to medieval literature, it is said that oyster farming started during the Tenbun Era (1532–1555). In those days, it was written that a “farming method was discovered in Aki Province during the Tenbun Era (source: Kusatsu Guide)”. 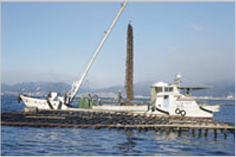 The Ishimaki rocking method (Ishimaki: oysters attached to small stones lined up on tidal wetlands and harvested through cultivation) and the Yaehibi method were employed. Before long with the technique advanced over time, the Hibitate method (oysters attached to wood or bamboo in place of small stones and then harvested) by which a greater number of oysters could be harvested was established. Once a large volume of oysters could be harvested with the development of farming technology, they began to be sold from the local Hiroshima area to other provinces via the Sanyo Line. 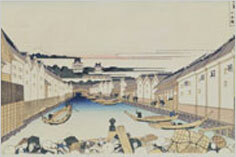 In the Enpo era (1670s), transportation by “oyster boats” started. “Oyster boats” originally designed for transportation were used for sales as well. Oyster boats advanced into Osaka where water channels and what were commonly known as happyaku yabashi developed (referring to the many bridges in the city) to deliver Hiroshima oysters. In this way, Hiroshima oysters which have been valued since ancient times are currently consumed throughout Japan, accounting for 57% to 58% of the total output in Japan. Japanese oysters spawn or release eggs and sperm into seawater around August. Those eggs and sperm are fertilized under the sea. 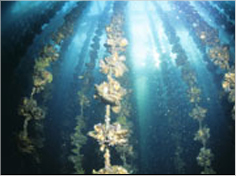 Newborn baby oysters swim under the sea for about 17 days. Shells enveloping baby bodies are formed about one day after fertilization. Shells at this time are called D-larvae due to their D shape. They subsequently form into a shape called Ambo larvae. The size around this time is only approximately 300 microns (0.3 mm). They seek out a place to attach to while swimming around with such small bodies. They attach to the attachment apparatuses, shell-gathering scoops, and what are called the shells of common scallops on the shell-gathering shelves placed in a relatively shallow sea. In winter of the shell-gathered year, young oysters strung on wires are suspended from rafts. Extending into a new year, oysters gradually grow. Fall in the following year is a full-scale growth season when water temperatures start to lower. They grow into plump large Hiroshima oysters. Full-fledged winter is an oyster harvest season. Wires are wound up with a winch, and attaching apparatuses fall into the oyster boat at the instant when the bottom wire is cut. When the boat is full of oysters, they are moved to an oyster shell removal site. Skilled women called uchiko-san remove the shellfish one after another from the shells.